Mexican Spanish voice prompts for Asterisk2Billing (A2Billing) & Star2Billing, the open-source Soft-Switch Billing system. Native Mexican Spanish voice artist with a professional business voice. 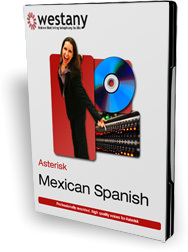 Entire set of Mexican Spanish A2Billing & Star2Billing voice prompts are included. Isabel for A2Billing includes voice prompts for Asterisk2Billing, Star2Billing and Asterisk all in one package. It also includes specific voice prompts to enable every feature in Asterisk, Trixbox, Callweaver, Elastix and FreePBX. Isabel for A2Billing and Star2Billing contains all the voice prompts for each of the six major Asterisk platforms. Namely Asterisk, AsteriskNow, Trixbox, FreePbx, Elastix and Callweaver. If there’s a feature that needs a voice prompt, then we have it in the product. Every single feature from VOIP billing, to voicemail, from IVR, to CTI, from VOIP Calling Card services, to Callback services, from Multi-Currency Balance to VOIP Residential services. All the voice prompts are recorded by Isabel, who is a native Mexican Spanish speaking voice artist. None of the recordings are generated by a text to speech engine (tts) or cut-and-pasted together. So you won't hear a synthetic or unnatural sounding voice. Isabel has been professionally recorded in our studio to achieve the maximum quality of both audio fidelity and correct pronunciation and inflection. Isabel can record any additional voice prompts to customise your installation. If you need specific announcements or custom IVR messages we can have them recorded and edited exactly to your specification and match the delivery, pace and pronunciation of the rest of the voice prompts. This ensures a seamless telephone experience for yourselves and your customers. Isabel contains directory structures for all versions of Asterisk to ensure that the voice prompts are located correctly regardless of which version of Asterisk is running on your system.